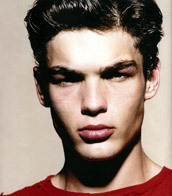 Jason is originally from West Virginia was one of the first models at wings model management. After signing with Wings Model Management, Jason has been on the cover of the Abercrombie and Fitch Catalog, Italian Vogue, MR magazine, and many other international catalogs and magazines. We have placed Jason with agencies in markets including Miami, New York, LA, Italy, Paris and London. He currently travels from West Virginia to New York booking modeling jobs.